Helping you find direction while getting fully funded. In just 2 hours a day for 10 days, get equipped to share your ministry with potential partners. Our interactive online videoconferencing is accessible most anywhere in the world. 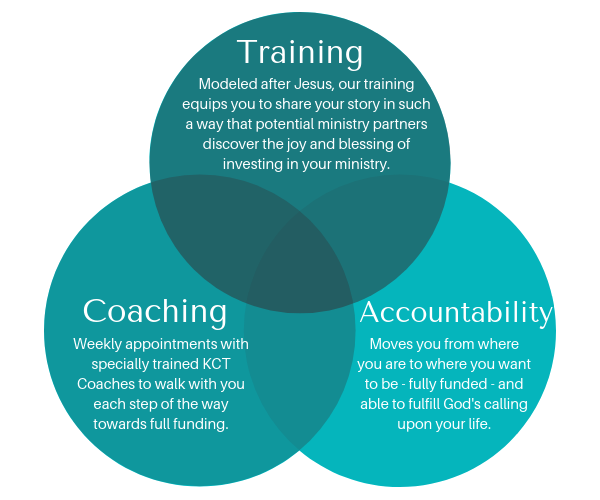 Just as Jesus used storytelling to reveal His message so to will our KCT Trainers equip you to use Jesus’ model for sharing your ministry through your own personal stories. Convenient 30-minute weekly online coaching sessions are scheduled until 100% funded. Coaching is a safe and sacred place that offers encouragement through the joys and challenges of partnership development while helping you to remain others focused with proven strategies to set and maintain goals. By continuing to keep the focus on allowing others to enjoy the eternal rewards of becoming a partner, partners are blessed, financial needs are met and full funding inevitably results. Even more, our highly trained and committed coaches have an in-depth knowledge of what it will take and how to best help you progress through the partnership development process and achieve full funding quickly. We hold everyone accountable to the standards they and their agencies themselves set, thereby allowing them to push through their fears and creative procrastination into courage in their individual partnership ministry and ultimately to full funding. Furthermore, our highly trained and committed trainers and coaches have an in-depth knowledge of the KCT process and understand what will be required in order to achieve full funding; a growing prayer life, growing dependence upon God, an attitude of gratitude, a willingness to share their vision through improved time management skills, and a willingness to stay on track with the ministry visit as it is learned are all a part of the process. As a result, spiritual muscles will develop as a part of this journey to full funding. ​Week 1 – Week 4. ​*0% funded to 49% funded. ​ *75% funded to 99% funded. "We loved the training and the modules but the key for us was meeting weekly with our coach. We are very motivated people and yet we needed weekly coaching and account-ability. We can't imagine how others less driven could do this without a coach." "It is so important to be able to tell your story in a very concise and yet exciting way. If you practice, you can get your point across with POWER in only 2 minutes." "This training has been such a blessing. I always knew that God gave these experiences to me for my benefit, but it makes so much sense that He would use them to encourage His body to be involved in what He is doing around the world." "As our pre-field time progressed our thinking changed from selling ourselves to getting people behind a vision. We also changed our terminology from funding and finances to partnering and investing." "I just want to say 'thank you.' Today I spent my afternoon sitting in the ICU with one of our partners whose son is probably not going to make it. Without the new awareness of this being a relational partnership, I would have missed the blessing I received today."